1. Preheat oven to 400° F. Lightly grease a 9 x 13-inch pan with non-stick cooking spray. 2. Rinse filets and pat dry. Place in prepared pan. 3. 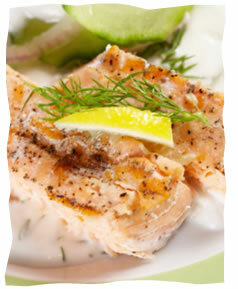 Drizzle olive oil and lemon juice over fish and sprinkle with garlic, dill salt and pepper. 4. Bake, uncovered, at 400° for 20 minutes. Arrange on a platter and serve warm or cold. Pinot noir from Israel Hi!